There are may definitions of what constitutes tribalism out there and I chose the Cambridge Dictionaries Online one for its simplicity and clarity. I needed something workable, not overcomplicated, as a lens to look at the martial arts/self defence world through So here is the definition from CDO. 1 The state of existing as a tribe, or a very strong feeling of loyalty to your tribe. 2 A very strong feeling of loyalty to a political or social group, so that you support them whatever they do. Recently I have had a few long chats with fellow school owners in other pats of the UK about the extent of tribalism that seems endemic in the industry. They, like I, continually try to stay away from getting sucked into it. The strap line of this magazine, truth not tribalism, guides my thinking. I know of many people who are involved in disputes and feuds with other practitioners on all sorts of issues, very public ones too and they all too often degenerate into ya boo name calling. Friends join in, tribes form, the othering starts and off we go. Just look at America tearing itself apart as righteous indignation fuelled by emotions that ignites conflict between Republican and Democrat, and we are still in the primaries. In the UK we have a referendum soon on our membership of the EU and it will get messy here too soon. No surprises here, as explained in ‘The Righteous Mind’, (Heidt 2012), we find it hard to get along with ‘others’ who think differently than us because our minds are designed to be moral. Not only that, we are hard-wired to be moralistic, judgemental and self-righteous, we are right, you are wrong. It is a carry over from the millions of years of living in tribes, starting with small family groups of hominids, and growing into larger and larger groups over millennia. In his book Sapiens, (Harari 2011/14), argues it is the innate and uniquely human ability to create imagined realities that then manifest themselves in norms and values that underpins our tendency towards tribalism. Nothing is real, not in the sense that all aspects of all societies are social constructs. As societies and cultures evolved overtime even peoples living in similar ecological conditions created very different imagined realities that manifested themselves in different norms and values. Take this alongside our biological evolution as sapiens spread throughout the world, staying one species, but through a mixture of natural selection, mutation and adaptation we gradually grew to look different too, we then had ‘races’ adding to the mix, lets throw in class and gender or it will just get too big. The combination of biological and cultural evolution is much debated in anthropology but if we stay with the general view that each fed off the other it helps us see how throughout the growth of human populations, however they were socially organised, hunter gatherers, agricultural, industrial and post industrial, we have remained tribal. We still have our shamans, totems and talismen today they just take on different forms, so it should not surprise us that we find it easy to form tribal views with the accompanying feelings of loyalty and belonging whatever the tribe does. If we fast forward today as societies fragment into ever smaller social groups we see a resurgence, I would argue, in tribalism. The great isms of the last century caused the loss of hundreds of millions of lives as people rallied to their totems and fought for the rights that their tribe supported, all imagined realities. In with fascism, communism and capitalism we can include the ‘great’ religions and when one overlays the other it becomes an intricate ideological web. We are all there somewhere in that web, I have a joke I share with my Catholic friends, I remind them that whilst I am an atheist, I am a protestant atheist. My background, my past, my experiences are influenced by my past including the choices I have made influencing the choices I have to make. The culture I grew up in, that I have inculcated, plays its part through the strength of attachment each of us feels through our shared values and norms. Of course the shared subscription to our imagined realities, invisible to most people is what makes this possible, these are incredibly powerful forces. 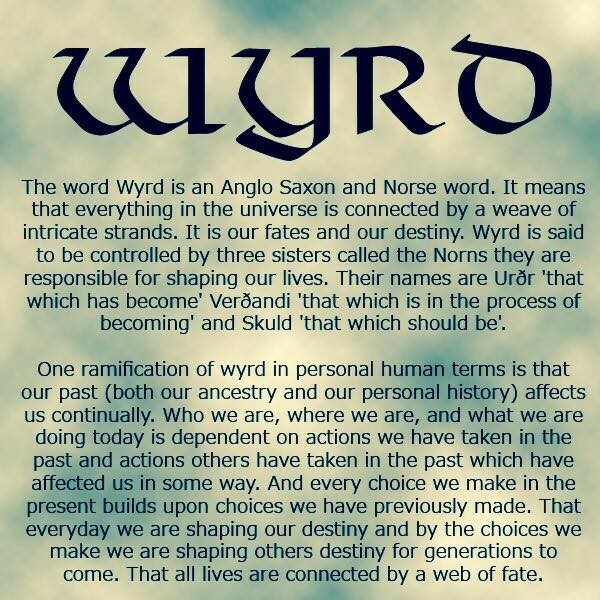 This meme from the internet links what we do with one imagined reality, I use this one as most of my heritage is more than likely Anglo Saxon, any other would do along with the whatever selective creation myth we may or not subscribe to. I wrote in January’s CM about the interaction of past,present and future. They are inextricably linked and our awareness of who we are, where we are going, who with, why etc. will develop if we acknowledge this. A web of fate is as good a description as any other for now. Most people do not like the above as it is too abstract a thought, the world does not just exist of subjective meaning devoid of objective reality. Of course there are objective realities, I sit on a chair at a desk typing on a laptop inside a house, I can see and feel them, they are real objects and I am surrounded by tens of thousands of other objects, they are real. Well this is no problem for us, objective realities are related to imagined realities. 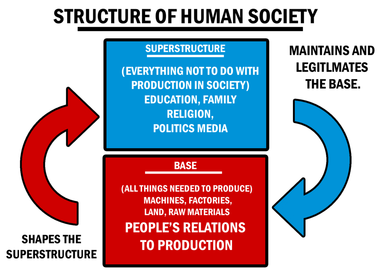 It reminds me of my studies in sociology when we looked at Marx’s base v superstructure model. Marx was interested in the interaction between the base and superstructure in order to analyse the structure of a given society and the social structures that proliferate from that structure. “Superstructure, quite simply and expansively, refers to all other aspects of society. It includes culture, ideology (world views, ideas, values, and beliefs), norms and expectations, identities that people inhabit, social institutions (education, religion, media, family, among others), the political structure, and the state (the political apparatus that governs society). Marx argued that the superstructure grows out of the base, and reflects the interests of the ruling class that controls the base. As such, it justifies how the base operates, and the power of the ruling class. From a sociological standpoint, it’s important to recognize that neither the base nor the superstructure are naturally occurring, nor are they static. I use it simply to demonstrate the complex relationships that do exist but I err towards the dominance of thought over matter, I think Marx got it partly right, I think the evidence that has emerged since he constructed his model would expand what he was claiming and whatever the structure, human thought was the root not the thinking and ideology of one class..
That the base and superstructure influence one another is accepted but the origins of ideas in primitive societies, beginning with the emergence of animism, but before that with the emergence of consciousness itself is not part of the model. Vast improvements in scientific methods, the codification of the human genome and other recent rapid advances have brought biological explanations for human behaviour back to the fore. As the genus Homo experienced significant changes in brain size, architecture, as our environment changed and different forms of social organisations and diet change they all combined to accelerate the process of evolution to eventually produce, via natural selection “a new kind of animal. It transformed into an animal who sets arbitrary standards of behaviour on what is considered to be right and wrong.” (Leakey 1994). Sapiens. It has been a long journey of discovery to get us to this point but my meanderings above are necessary to help me get a handle on the behaviour of my peers. What causes, grown men, mostly, to indulge in spiteful name calling, in public via social media for instance? My system is better than your system, my style better than yours, your rank meaningless whilst my lineage is pure…..
People fight over the value of awards ceremonies, politics abound and in the end the sum result is we are all the lesser for it happening. The best thing is most of those involved adhere to warrior codes that are better than those of their foes, they claim to be rising above the argument whilst sinking deeper into the mire, they gather sycophant supporters who all reassure one another they are all wonderful people whilst but the other side are not. It is tribalism writ large. Yes we all see obvious fakes, the proponents of empty force for instance, the con merchants. We see people with numerous dan grades, some they earned others awarded by mates, or worse still bought. We all know this happens. Does it stop us doing what we do? The answer should be no, the answer should be well actually it makes me redouble my efforts to become the best I can so that I can better help others become better than me. Getting bogged down in tribalism, sticking to the tribal view whatever the tribe does, is a destructive process. It is a downhill struggle as rather than concentrating on what you are doing, possibly within your own tribe, interacting with others and seeking knew knowledge, you sink into the trap of defining yourself by what your enemy does not do rather than what you do. The focus shifts from developing a clear and coherent training experience underpinned with principles based teaching, to a we are better that them offer. Your tribe members will support you, like you on FB, cheer you to the echo but this has no value outside your tribe. Emotions get triggered all the way through this and as I see the feuds develop, and sometimes spread, you can see emotions fanning the flames, Just like the fire triangle with heat, fuel, oxygen on 3 sides, replace this with emotion, social media and tribalism and you can smell conflict in the air before you see the flames. Everything you are arguing about has no objective reality they are ideas. They are ideas that have originated in our unique ability to create imagined realities, your imagined realities are based on your past and your present and an infinite number of potential variables including the long evolutionary journey of your ancestors and all their thoughts, experiences and choices made. When tribalism dominates the mindset of a social group, whatever the group does then we have a form of group-think and individuals get lost and the process controls the tribe instead of the other way round. I will say for the record tribes are cool, I belong to many and some overlap. I have tried to show that this need to belong is so deeply rooted in us that it is practically undeniable. But tribalism is a problem, in my opinion, tribes exist only by comparison to other tribes who are different. If what you do is all fine and dandy and the best there can be, then those different tribes out there must be getting something wrong. Ignore them, it will have no baring on what you do, better still, talk to them and if you can share some things do so, if not part in peace. If you do see yourself as a warrior, I do not for the record, if you claim to have a code of conduct, I do not for the record, then follow it. Try not to become a massive cockwomble in public because your emotions pour out all over social media and expose your tribalism.